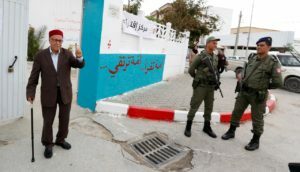 Independents’ lists won 2,367 seats in Tunisia’s municipal elections followed by Islamist Ennahda party which managed to beat rivals with 2,135 seats nationwide. Ennahdha came first in several of the country’s largest cities including Tunis, but fell short of winning outright majorities. The Nidaa Tounes party of President Beji Caid Essebsi clinched 1,595. Observers see that an alliance between Ennahdha and Nidaa Tounes, partners in a coalition government nationally since 2014, could mean independents will remain in opposition. Turnout was low as 64% of voters did not show up to cast their votes. The elections were described as a milestone on the road to democracy in the North African country, which has been praised for its transition from decades of dictatorship. The elections are also a crucial step towards a decentralization of power in line with Tunisia’s post-2011 revolution. Posted by Khalid Al Mouahidi on May 11, 2018. Filed under News, Zoom. You can follow any responses to this entry through the RSS 2.0. Both comments and pings are currently closed.